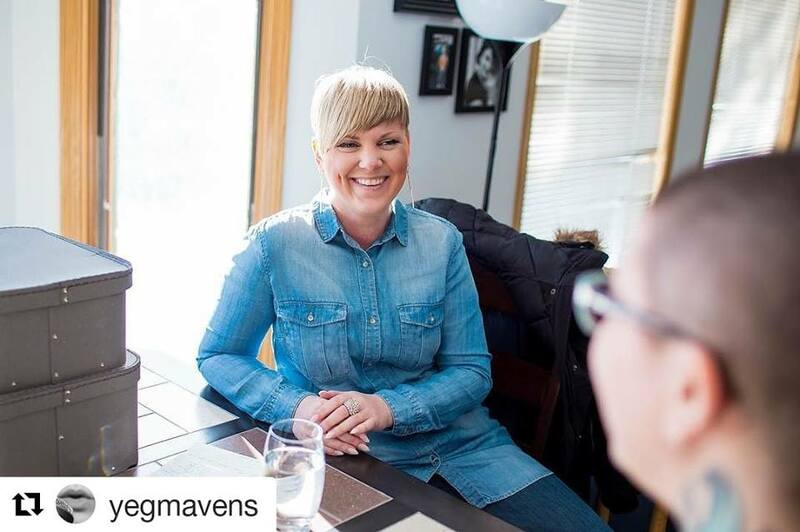 Photo above: This photo was taken by Lauren Dary during my session on That’s So Maven. One question that I often get asked is, what does a typical day or week look like for you? What is a day in the life of an event planner? What is a day in the life of a tycoon? The honest answer, which I bet you already knew, is that no day is alike. I could be working on events that we have on the go, drafting up a proposal, finalizing an event plan, wrapped up in a team meeting, meeting with potential clients, strategizing next week’s communication plan, planning out action items for next week, sifting through endless emails, managing project timelines for our portfolio of events, working on the company’s marketing and outreach, going to site visits, attending networking or industry events, working on decor and props, and the list goes on. To give you a closer look at what we’ve had on the go, let me get you up to speed on what we’ve had going on over the last few weeks. Me oh my, we’ve been busy! 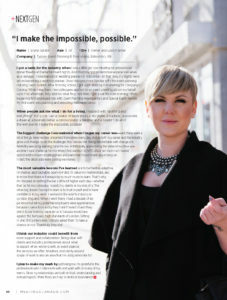 I was very excited and honored to be featured as the NextGen by Meeting’s Canada. I had the opportunity to receive a full-page spread in their March/April 2017 publication, where I was asked a variety of questions related to my experience being an event planner and within the industry. A big ‘thank you’ to That’s So Maven for having me on their podcast. Being such a big fan and avid follower of the show, it was very exciting to be asked to participate. The show features so many amazing, inspiring, and empowering women that it is an honor to now join the group. If you haven’t listened in yet, you can check out my Episode #41. I chat about how I started Tycoon Events, when and how I caught the entrepreneurial bug, and what life in the day of an event planner/business owner looks like. You can also access the link, and all of the other podcasts, via any of “That’s So Maven!’s” social media platforms. And if you aren’t already following the podcast, what are you waiting for?! You’re in for a treat and get ready to be dazzled by some of Edmonton’s #bosswomen! With so much on the go, it was definitely time to think about expanding our team. I am very excited to welcome our two newest tycoons to the Tycoon family, Allison Leonhardt and Carole Jayawardane. Allison brings a wealth of professional communications and events experience. She’s written everything from help manuals, to promotional content, to newsletters, to media advisories and press releases. She has a strong background in fundraising and sponsorship strategies. She is currently finishing up her Public Relations diploma from the University of Victoria. When she’s not writing or planning up a storm, you’ll likely catch this analytical thinker … or not …cycling around the City! She’s energetic, a quick and adaptive thinker, flexible, and extremely diligent. A natural fit for our team! When Carole isn’t busy with event work and logistics, you’ll likely find her practicing meditation or yoga. She’s calm as a cucumber, inquisitive, hard working, and extremely motivated. Let’s take a moment to also re-introduce our third tycoon, Lisa Blue. Lisa’s experience is derived from a background of working in the hospitality industry, from hotels and resorts, to restaurants and retail, and supporting operations and executive offices. She is a dedicated professional with more than thirty years of combined experience in event planning, customer service, human resources development, cultural awareness and employee engagement. Her work reflects a focus on raising the standards and best practices for the event planning industry, preserving and enhancing quality of service, and offering valuable assistance and direction in creating the ultimate guest experience. Lisa’s passion for the industry, her ability to create and strengthen connections, her astute awareness and understanding for people and relationships, combined with her energetic and enthusiastic spirit are what make Lisa such a great asset and member of our team. A power house team, I’d say we’re living up to the ‘Tycoon’ name, wouldn’t you agree?! We’ve been busy, busy, busy working with TEC Edmonton on the 15th annual VenturePrize Awards event that happens tomorrow (May 4th) at the Westin. With roughly 350 guests expected to attend and some of Edmonton’s business leaders, we’re very excited to be a part of this event. Stay tuned for photos following the event, but for real-time updates be sure to follow TEC Edmonton’s twitter feed for live coverage of the event at @TECEdmonton. You can also find out more about TEC Edmonton and the event at www.tecedmonton.com. Working with the Alliance francaise of Edmonton on their annual Make Music Edmonton event, you can expect more entertainment and an elevated experience this year. Still a ways out from the event, there’s a lot going on behind the scenes. From coordinating details with the city, finalizing a marketing and communication strategy, working on grants and sponsorship outreach, securing venues and musicians, planning out staging and rental needs, working on the volunteer and staffing plans, addressing all logistic needs, sourcing live entertainment for onsite activation … there’s never a lack of something to be working on! The event, not to be missed this year, will take place on Wednesday, June 21st from 5:00 pm to 9:00 pm on 124 Street, between Jasper Avenue and 108 Avenue. For more information about the event please visit www.makemusic-edmonton.ca and follow along on their social media platforms for updates. Brand awareness. All businesses and organizations need it. All businesses and organizations want it. But how to position your business in an effective, impactful, and notable way can be challenging. In a time of heightened competition and a high density of messaging, we turn to experiential marketing as a means of creating memorable touch points with our audience and leveraging all possible opportunities. Working with small businesses especially, we love LOVE love turning to events as a unique way to strengthen brand awareness or create a ‘stand up and be noticed’ reaction for a brand launch. When coming up with an event strategy, our approach was that the purpose was to host an event that showcases L Photography as the source for brand photography and as being a connector for small business owners and professionals to brand professionals. Very excited for what’s to come, so stay tuned! If you want to be kept in the loop and are interested in attending the event, sign up to L Photography’s newsletter at www.lphoto.ca for event announcements. We’re also happy to welcome back two of our favorite clients this year – The Little Potato Company and 124 Street Business Association’s “All is Bright” winter festival. Stay tuned for more details! One area of events that I love, love, love are the venues themselves. To me, the venues act as a canvas for the event. You might have seen our venue showcase, featuring venues we profiled during our “Let’s Crawl” micro venue crawl series. If not, you can check them out on our Instagram feed. We’re working on a venue featurette project right now and should be rolling it out in the next couple of weeks. The purpose being to to showcase some hidden or well-known gems in the City, and put the spotlight on some local businesses. Stay tuned as we announce more details about the project and for venues, stay tuned for details on how you can be involved! Curate an immersive, customized opportunity (an event) that turn our client’s mission (their dream, their vision, their strategy, their brand story) into connections, commitments, and actions that move, inspire, and provoke thought.